A stitching retreat | NJNA is Blogging! 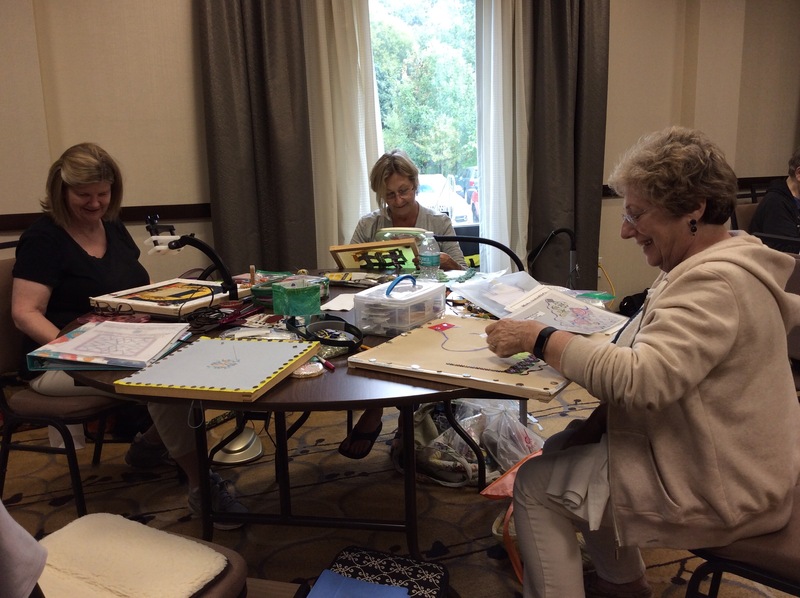 This past weekend five NJNA members attended a stitching retreat offered by the Monmouth Chapter, EGA, in Voorhees, NJ. There is a needlepoint shop nearby in Merchantville, the Nimble Needle, run by Karen Milano. Karen opened earlier in the day than her usual hours and gave those attending the retreat a 20% discount! Her new location is roomier, and it is much easier to find threads. Karen has a wonderful selection of threads as well as great accessories (think magnets, with bling and without). She is also wonderful at helping select the threads needed for a painted canvas. Then it was on to stitch. There were twenty three of us taking over the Hampton Inn along with the families participating in a boys soccer tournament. We had the large meeting room with wonderful lighting both day and night. (I never used my light and stitched on congress cloth without my magnifiers!). We sat at round tables with four Stitcher’s at a table, ample room for us to spread out our supplies. Most of us worked on several projects during the three days we stitched. We took over the room at three Friday afternoon with all our bags and carts, set up our edible treats and were ready to go. Stitching continued after dinner with participants dropping out for bed as the evening progressed. Last one out locked the door and first one up to stitch asked the front desk to open the room. There were a wide variety of eating places within five miles on route 73. Or you could walk across the parking lot and eat at the Voorhees Diner which almost everyone did on Saturday evening. If you had been there, you would have seen Ada D. working on her Japanese embroidery and a birth sampler. Ellen S. divided her time between a painted canvas of a snowman and a counted Bargello design, “My Favorite Things”. Tina F. spent her time working on a birth sampler for her grandson.. Sue R. has a beautiful painted cuff she was stitching as well as a painted autumn canvas on which she was stitching a beaded pumpkin and the background in a sign for her newly painted bathroom. Sue C. Divided her time between the chapter project, the Magic Shell and beginning her Bargello, “My Favorite Things” which she bought after seeing Ellen’s–I finished purchasing the threads at Nimble Needle on Friday. There are so many benefits to a retreat like this, time to escape from your daily life–no laundry, no meal preparation, no work! It is a chance to meet new stitchers and to share ideas among all, a chance to see new designs and projects and to admire the work of others. We learned the names of excellent finishers for our beautiful pieces. We heard about good shops and what they offer. Best of all a productive, relaxing weekend for all. By Sunday at three we were headed back to the real world refreshed. Sounds absolutely wonderful — can’t wait to be able to join in!